Travel portal TripAdvisor continues to push ahead with its mobile and social acquisitions: today the company announced that it has acquired GateGuru, a mobile app that provides real-time information on airports, weather, and flights. Much of that is picked up from crowdsourcing, not unlike Waze — acquired by Google last week — does with road travel. Terms of the deal between GateGuru and TripAdvisor have not been disclosed but we are trying to find out. This is not an acqui-hire but a direct expansion of TripAdvisor’s services to its users. As more people take to mobile and social networks, the company is looking to extend what it already offers online — a huge database of user-generated content giving reviews of destinations, hotels and other things travel-related, which currently brings in some 200 million monthly active users. In the case of TripAdvisor, it’s almost certainly easier to acquire and tap into services that have already been built rather than create them from scratch themselves. ”Flying is often an essential part of a trip and we have continually developed our suite of flights products, from the pricing and availability search on TripAdvisor, to our award-winning SeatGuru.com, with seat maps and more” said Steve Kaufer, co-founder and CEO TripAdvisor, Inc., in a statement. “GateGuru nicely complements our existing flights products and we look forward to working with the GateGuru team as they continue to manage the GateGuru app and add great functionality to the TripAdvisor mobile experience.” It helps, too, that GateGuru is positioned to be in a good place for ubiquity, with apps for iOS, Android and Windows Phone in place already. On one hand, this is a sign of the times about what is big with users in the market today. Travel and mobile naturally go hand-in-hand, as does real-time information once a user is actually on the move. The sorts of data that get fed into GateGuru include weather forecasts, security wait times and real-time flight status information. 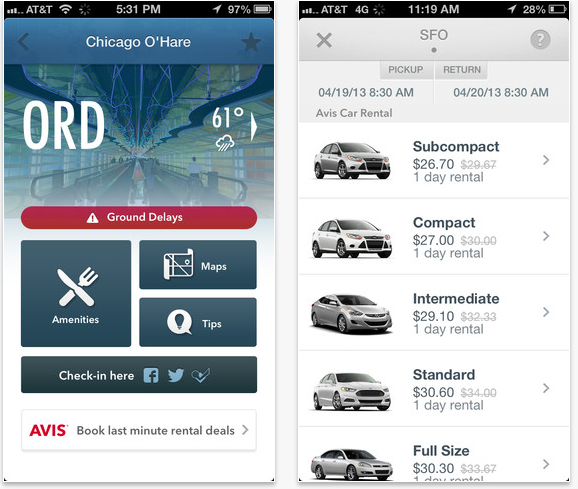 But, as you can see from the screen shots below, you can also use the app to compare prices on car rentals and then subsequently rent a vehicle through the app. You can see how kind of one-stop app portal could be expanded to include many other functions. It helps, too, that TripAdvisor in December got a big injection of cash from Liberty Media, which took a $300 million stake in the company; it could be some of that fuelling this series of acquisitions. The news today follows TripAdvisor buying another mobile/social startup, TinyPost, in March of this year, followed swiftly by JetSetter from Gilt weeks later, and then CruiseWise in May. Other socially-focused acquisitions have included Wanderfly in October 2012. Like JetSetter, GateGuru is based out of New York, where it will remain. The team behind the app, the company says, will report to Bryan Saltzburg, GM of New Initiatives and leader of the TripAdvisor Flights product and its SeatGuru brand. GateGuru, founded in 2011, had raised at least $800,000 with backing from a pretty illustrious set of investors. They include Chamath Palihapitiya, the former Facebook exec who is now running the Social + Capital Partnership VC fund; Allen Morgan, the former MD of the Mayfield Fund; and Tom Glocer, the former CEO of Thomson Reuters, among several others. GateGuru has even deeper links to the investment world: its founder and head, Dan Gellert, used to be a VC himself, working for Time Warner Investments and JP Morgan.